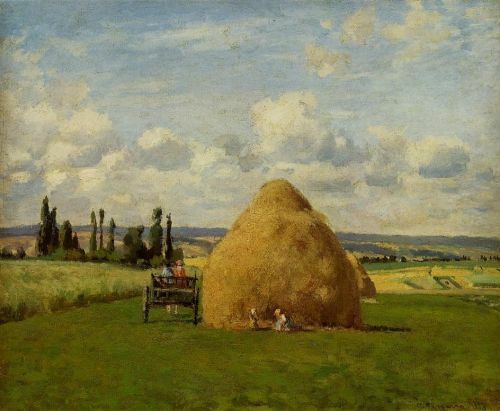 It’s hay-making times in Nottinghamshire, and we get to follow inexperienced (in love) brothers Maurice and Geoffrey Wookey making a haystack, having lunch and how they both end up spending a dark and rainy night with a lady each. That, and the title, makes it sound as if it’s a prelude to the, in parts, very saucy Lady Chatterley’s Lover, but it really isn’t. One gets stuck up a haystack with his girl, a girl from Hannover (in Germany) who works as a governess for the local vicar’s children. Maurice puts some tarpaulin over the haystack when it starts to rain, the ladder falls to the ground, and they’re stuck. Meanwhile, his brother Geoffrey has encountered a tramp’s wife – the tramp has wandered off somewhere and she’s tried to find shelter in a shed or something like that, which is where Geoffrey has gone to get out of the rain. They talk and spend the night together. The story was a bit difficult to get into at first, because the dialogue between the brothers is written in dialect – albeit not the 19th century unimpenetrable Yorkshire brogue of Wuthering Heights. It eases off after a bit as well. It’s a touching story of two brothers and their strange nights. We don’t actually get to know exactly how Maurice and the governess spend the night, because once the ladder has fallen down and they have to stay, the story switches to Geoffrey, and then stays with him as he encounters the tramp’s wife – which then turns into a rather sweet love story. The ending is very abrupt. In the morning, Geoffrey puts the ladder back so that they can climb down, they join him and the woman in the shed, and then it’s a very quick wrap-up in the style of “and they lived happily ever after” before you can catch your breath, and I felt that’s a shame – I wanted it to go on for a bit longer. It had a nice pace and all of a sudden, “And that’s it! The End”, and didn’t quite give the chance of parting in style at the end of a nice visit – more like being shoved out of the door and having it slammed shut behind you. This is my second review for the DH Lawrence Challenge 2010. One Response to "Love Among the Haystacks by DH Lawrence"